Alphalite Alpha Series LED Wall Pack - Contact Us Today! The High Performance LED Wall Pack is a modern and versatile, integrated LED solution that delivers long life and energy savings within a slim, low profile design. The rugged housing offers advanced thermal management and protection against outdoor environments without compromising aesthetics. Outdoor wall-mount applications. Building facade. Commercial, industrial, retail, hospitality buildings that demand long service life and low maintenance. 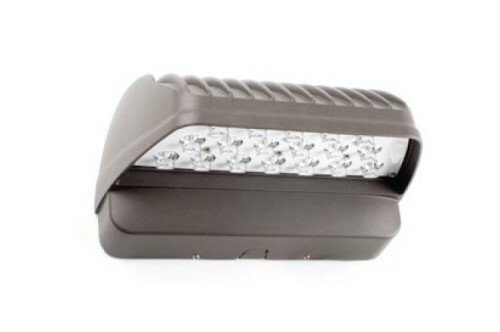 Rugged die-cast aluminum housing withstands outdoor environments. Outer surface treated with durable powder coating to provide resistance to corrosion, rust, weathering, and UV degradation. Available in various color finishes. Performance engineered, integral heat dissipation fins provides superior thermal management for long life and reliability. Luminaire utilizes long life, high efficacy LEDs and a highly efficient, reliable LED driver. 120V-277V input voltage for increased versatility. Photosensor option available. For higher lumen, high mounting height models, dimming option available. Comes equipped with quick disconnect for compliance with US code. Luminaire mounting designed for standard J-Box. Can be mounted directly to surface. Features multiple conduit entries. Precision-monded lenses provide various photometric distributions depending on application. LED lenses optimize performance and increase delivered light to desired areas. Outer surface treated with durable powder coating to provide resistance to corrosion, rust, weathering, and UV degradation. Available in various color finishes. ETL listed. DLC QPL listed. All components have safety approvals.